Pay a visit to one of the toughest railroads in the eastern United States, CSX's old Baltimore & Ohio line over Sand Patch Grade. In this program, you'll see the line on the east side, from Cumberland, Maryland to Sand Patch, Pennsylvania. Enjoy trains at the Cumberland Narrows, Hyndman, Fairview, Falls Cut Tunnel, Foley, Mance, Sand Patch and much more! As a special bonus we go a few miles down the west side to see action on that side of the mountain as well. If you like contemporary diesel action, then this program is for you. You'll enjoy plenty of CSX freight action as well a numerous appearances by Amtrak's "Capitol Limited". With a twisty climbing mountain railroad, long heavy freights, and shiny passenger trains, you can't go wrong. You'll want this program in your collection today! Running Time: 90 minutes. Features chapter menus and the ability to turn the narration on/off. rrvideojunkie (usa) on 2014-07-04 05:13:27. The camerawork is very good and some of the newer CSX motive power is seen(gevos', rebuilt SD40-2's). This is the only Sand Patch video I have on blu-ray so that makes it special. The narration is informative. Other than that it's just another of many Sand Patch videos, and I am sure there will be more. I guess I can't complain though as I always buy them. Nikhil Murthy (Redmond WA) on 2018-01-25 16:24:59. This program concentrates on Sand Patch Grade beginning in Cumberland, MD and heading as far west as Meyersdale. Although the program mainly concentrates on CSX freights, Amtrak's Capitol Limited makes its appearance and 2 significant P42s appear in this program: #145 (The Phase III Heritage Unit) and #42 (The Veterans Unit). As with many of Railway Productions programs, this program has lots of informative narration as well as old photographs that supplement the detail of the narration. Searail (Brooklyn NY US) on 2016-04-29 08:39:14. Nice to see a more recent visit to Sand Patch Grade. Good locations, nice history and use of maps. Was a bit disappointed with the minor pixilation in the Blu-Ray and the videographers tendency to rapidly edit the viewing angles of the trains once the locomotives passed. Overall a good video that captures the grade in transition. mySP7377 (San Diego, Ca.) on 2015-03-07 18:23:20. 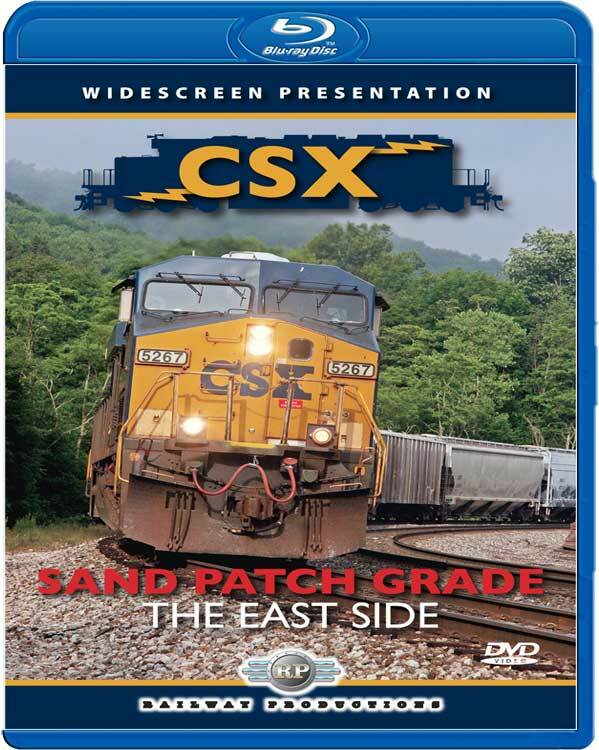 Really enjoyed this DVD its nicely photographed with informative narration, graphics and maps, every type of train CSX runs is covered with some nice angles and views, photo quitity is great and scenes are well lite, motive power is from the oldest CSX has to the latest GE's and EMD's, I would give it 4 stars out of five a "Must have" for any CSX fan and railbuff's how like big main line action. run8anderson (Basking Ridge, NJ) on 2014-07-21 15:01:27. Good product. ....the usual great research and narration from Railway. Great videography. The only hiccup was a mislabeled train coming downgrade on the East slope (labeled a westbound).....I'm still giving 5 stars. Did you know that you can watch this for free On Amazon instant prime on the go video serice? Try it. Steamboy (Revere MA US) on 2017-01-27 06:39:06. In this made in 2013 Railway productions DVD only, this program features the starting point at Cumberland Maryland with Amtrak's Westbound Capitol Limited at sunset, and a short visit to the Western Maryland Scenic railroad at the original 1913 Depot and Helmstetter's curve with the now disassembled Lake Superior and Ishpeming steam engine 734, to the summit of the grade. However as the title goes, it's main majority is the different CSX freights both eastbound to Cumberland, Grafton, point of rocks, and Baltimore, as well as westbounds to Pittsburgh, Chicago, and many other points. There are also different locations along the way, plus some would wonder what makes both Cumberland and the climb over the east side of the grade one of the best CSX hot spots of the eastern scenery of the USA. Despite that Jarrett made a mistake at the beginning when he said east to D.C. When it should've been West to Chicago. Oh well. 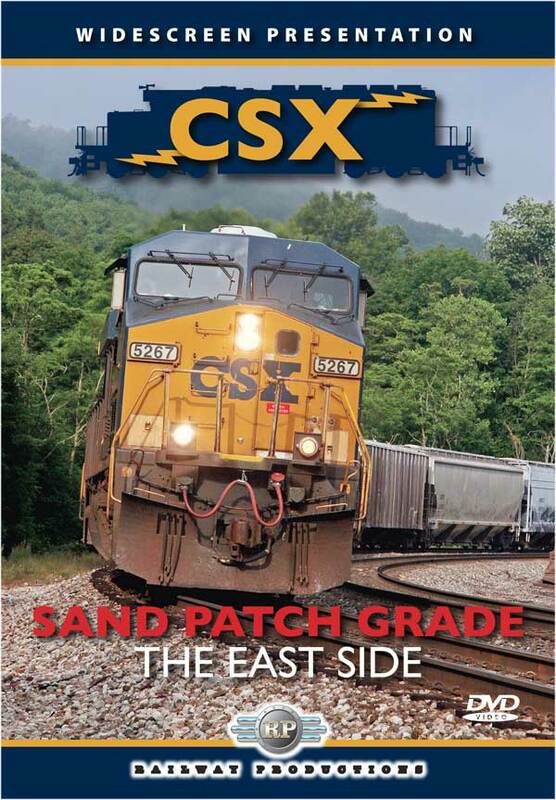 This is a must have for any CSX lover or Allegheny mountain tourist to see the steepest grades of the mountainous east.